Velux loft conversions are the most cost effective way of maximising the light into the room and creating a statement feature. 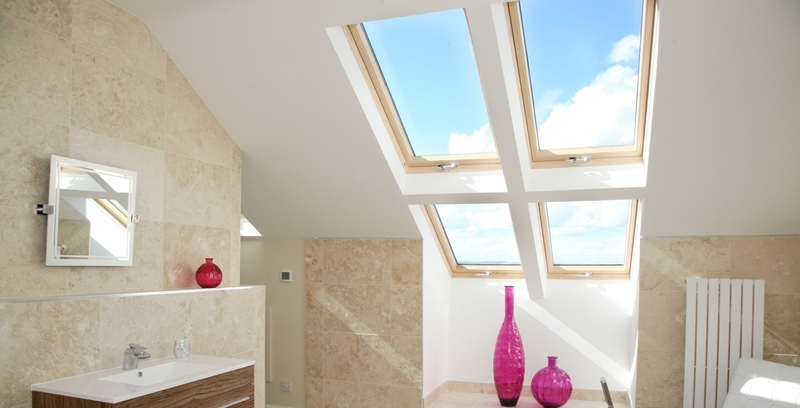 With the vast range of Velux windows available it is possible to have a small, single sky light window adding light to a dark stairwell to a statement Cabrio System that folds out to create a stunning balcony area within the roof space. The style and amount of Velux windows to use is down to customer requirement and dependent on the use of rooms. For bedrooms with a view, installing a Duo System is often a great way to create a stunning feature within the room and make the most of the surroundings allowing it to be seen while sat on a bed or chair. A bank of 4 windows grouped together usually 2 longer M08 style windows at the top with 2 smaller style M04 windows underneath are the most common style of Duo’s though these combinations can be varied to suit any requirements. For conversions in built up areas where privacy is paramount then a simple S06 window side by side or front and back is often sufficient for light and ventilation. Velux windows also come in different finishes and styles. Please read through the various options available to you and think how they would best compliment your new loft room. VELUX Top-Hung Roof Windows give an uninterrupted view when fully open, creating extra headroom and a feeling of being outside. Combine them together to give dramatic visual impact and flood your home with daylight. Because the handle is at the bottom, our top-hung roof windows are simple to open and close, with operation assisted by powerful yet gentle springs. The window swivels in its frame for easy access and cleaning purposes. VELUX Centre-Pivot Roof Windows offer excellent quality, versatility and value for money. Adding natural light can have a positive impact on the value and feel of your home, so by combining these windows together you can create a dramatic visual impact which will transform your home with daylight alone. The comfortable top control bar allows you to open and close the window, as well as ventilate the room, with ease. Once you rotate the window and lock it in position, you’ll have both hands free for easy cleaning of the outside glass. The convenient top control bar can also be used for ventilation purposes even when the window is closed and can rotate 180º for easy cleaning. Centre-Pivot Roof Windows are available in white polyurethane or pine. The electrically operated INTEGRA® windows in white polyurethane and pine also offer comfort at the touch of a button. The CABRIO® Balcony System fits snugly to the roof when closed, but when opened it becomes an instant balcony in seconds. It can be combined with Top-Hung roof windows and fixed bottom elements to offer extra views, ventilation and daylight. All of these are a great way to add value and a real wow factor to a property. Our CABRIO® Balcony System comes with safety glazing as standard, which combines a toughened outer pane with a laminated inner pane to ensure additional safety. The clear and clean coating on the outer pane also keeps the glazing cleaner for longer. • Window opens out into an instant balcony in seconds. • Stunning addition to your property, bringing in extra daylight and a stunning floor-to-ceiling view. • Lower section comes with safety glass to reduce the risk of injury. • Upper section has all the benefits of our standard Top-Hung GPL roof window. • Can be used as an emergency exit. Our classic windows blend tastefully into the roof of your building with a vertical centre bar and black exterior finish. • Available in either centre-pivot or top-hung opening. • Black external profiles and glazing bar. • Recessed installation for slate roofs. • Rotate 180° and lock in place for cleaning of outer pane. Inviting the light into your home is one thing, but how you manage it is another. Thanks to VELUX’s extensive range of specially designed blinds, you can control not only the amount of light a room receives, but its direction and quality.